There’s no reason chambers should continue to play by 20th-century rules anymore. There are (at least) 5 digital tactics member-based organizations should be using to drive participation and engagement in today’s world. Most chambers have some sort of social media presence. But do you use it as a strategic tool to promote your chamber? Are you using it to initiate discussions and dialogue? Don’t overlook social media as one of the greatest distribution channels ever created to build awareness and drive engagement. Still using old-fashioned ways to engage members? If prospective members start to see you as “the authority” because you’re a source of trusted information, they’ll be more likely to follow you, or better yet, share your page. Think of it this way. With social media, you can engage people where they already congregate rather than requiring them to come to your website. Erik Qualman, author of Socialnomics said, “we will no longer search for products and services, they will find us via social media.” Social media has become a critical tool for how people find products and services. And its impact will only grow. Chew on this: 92% of children in the U.S. have a digital footprint. Over 50% of the world’s population is under 30-years-old, meaning the percentage of socially engaged people will only increase. 93% of marketers use social media for business. Chambers should, too. If you ignore this channel, you do so at your own peril. Face-to-face meetings still have great value, but they aren’t the only way to engage. 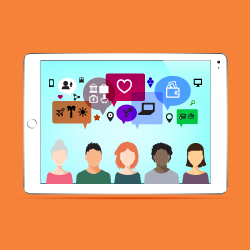 Check out the other four tactics that are sure to be game changers in Why Member Engagement No Longer Means Face to Face.